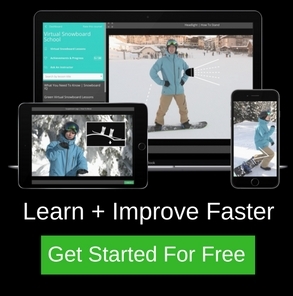 The goal in snowboarding isn’t getting to the bottom. It’s about having as much fun as possible on the way down. To have that fun on the way down we need to get to the top and the chairlift is how we do that. The chairlift can be intimidating if you are just learning or riding at a new resort with steeper and narrower runouts at the top than you are used to. 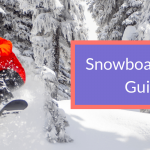 Gain the confidence to ride the chairlift by knowing exactly what is going to happen and the steps you need to take to successfully load and ride off. When you are approaching the chairlift and coral area it’s always best to slow right down and come to a controlled stop. The loading area can often be busy with a large variety of ability levels funnelling into one place. Keep your head on a swivel and be aware of your surroundings. Take out your back foot from the binding so you have a free foot for skating. Fold down your high back as it can catch on the chair when you sit down. Skate up to the waiting line / gates. Watch as the chair in front passes you then skate forward to the designated stopping spot. Look behind you to help anticipate the chairlifts arrival. As the chair touches the back of your legs smoothly sit down. Always make sure you pull down the safety bar. Put the board on the foot rest or if there is no foot rest hook your toes underneath the heel edge with your free foot to take some weight off your leg. If you are resting the board on a footrest you can undo your binding buckles a few ratchets to let your foot breathe and get some circulation flowing back in there if you ride with tight bindings. Sit back, relax and enjoy the views. Some of the best conversations you can have will come on a chairlift ride in nature. As the chair approaches the runout, lift up the safety bar. Lift the nose of your board slightly so that it doesn’t catch on the ramp. Let your board touch the runout ramp and stand up. Stay relaxed and keep your head up, look where you want to go – If you look down you will go down. Have a little extra weight on your front foot. Slide your free foot against the back binding and push into it to stop it sliding around. 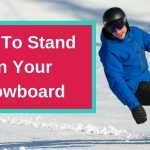 Maintain alignment of your shoulders with your hips and the snowboard. Try to have neutral posture in your upper body. If you break at the waist or lose alignment with your upper and lower body, it will limit your control. Once you dismount the chair or if you fall, clear the run out as quickly as possible to avoid being taken out by people coming off the lift. 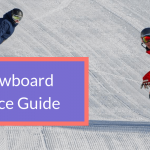 Riding on the chairlift is a fundamental part of snowboarding and should be enjoyed. 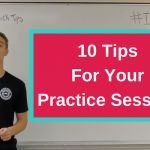 If you are nervous, you will tend to tense up and that’s when accidents can happen. Follow the pointers to stay calm and in control through the whole journey of riding the chairlift.